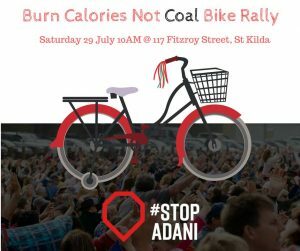 Join a colourful crowd of cyclists as we start at Michael Danby’s office in St Kilda and pedal 15km to Bill Shorten’s office in Moonee Ponds, making a song and dance about the future we want. MPs need to know if they don’t #StopAdani, we’ll elect someone who will! Who should join? Anyone who can get their hands on a bike and is comfortable riding on roads and bike paths. Right now the Federal Government are considering making a $1billion loan to build the Adani mega coal mine in Queensland. Adani has made an application for the loan through the Northern Australia Infrastructure Facility and the Government are due to make a decision within weeks. Now is a critical time to show our pedal powered people! All that’s standing between us and a clean energy future is a handful of big polluters who want to protect their profits. It’s time for them to get out of the way, so the rest of us can get on with building a sun- and pedal-powered country!